Making national headway with her debut single ‘You Are the Mountains’, in late 2015 Alice was a finalist in the Triple J Unearthed NIMA competition and named one of the 5 new Indigenous artists you need to hear whilst compiling airplay and praise across Triple J, Radio National and community radio. Now proudly managed by Penny and Logan and signed to Australia’s longest running Indigenous music label CAAMA music, Alice will perform at BIGSOUND for the CAAMA Music Showcase among a line-up of incredible artists such as Apakatjah and KnD. From Country Victoria, Alice grew up aside the sandstone mountains and wildflowers of the Grampians, still inspired by her roots Alice now calls Melbourne home. 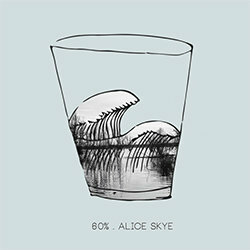 60% is the first single to be released from Alice Skye’s forthcoming debut album 'Friends With Feelings'. Alice explains "60% is about wanting to share things with someone but not wanting to overwhelm them. Not wanting to rely on someone... but also, wanting to rely on someone!"